I really like the word for “donuts” in Chinese. 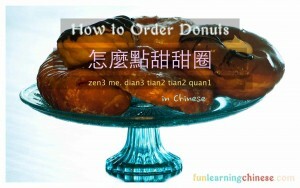 The meaning of “donut” is clearly understood from the (Chinese) characters. It implies part of the trouble I have. I can’t eat only a little bit of donut. We have a way to deal with this. We usually only eat donuts for special occasions. That way I don‘t have to be limited. I can buy quite a few flavors. We cut up and share them all. All of the flavors of donuts look very delicious! Of course, I still need to be careful. If I eat too many donuts, my stomach will be uncomfortable. The whole family helps me eat them. So I can order two dozen in a big box. However, they must all make sure I get to eat cream filled and old fashioned buttermilk donuts. …………(nà)(chà bu. duō)(shì) [(yī yàng)(de.)]. …………(that)(nearly, almost)(to be) [(same)(adjective marker)]. ❷ This word was interesting to me, because of what the individual characters mean and how they come together for this particular word. 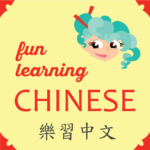 場 (chǎng) is listed first in the dictionary as meaning “area” or “space.” It is the same word used in 飛機場 (fēi jī chǎng) “flying machine area” or”airport”, and 市場 (shì chǎng) “market place.” 合 is used to mean “gather” or “collect,” so that when put together, you have a place where (implied people) get together, so there must be some occasion! ❹ Here I could have used the word: 噁心 (ě xīn), which means “nauseated,” if I had wanted to indicate a stronger level of discomfort, but I don’t eat THAT many donuts!